Who Am I as an Artist & Educator? - Jo Anne Sula's Art Portfolio -Integrating the Arts in Curriculum. Jo Anne Sula's Art Portfolio -Integrating the Arts in Curriculum. Who Am I as an Artist & Educator? Jacob Lawrence Protest Image: "Education over Politics"
Art has always been one of my favorite subjects in school. From drawing with oil pastels in Kindergarten, to throwing clay in high school, I have always loved art. Though I do not draw very well, I enjoyed every art class I have ever had. I especially enjoyed my drawing and painting, and ceramics classes during my junior year of high school. My strong interest in art is one of my strengths as an artist. I think that as an artist and as an arts educator, it is very important to be passionate about the arts, as it will reflect through your artwork and through your teaching. Another one of my strengths as an artist is my patience. Creating beautiful works of art takes patience, and a lot of it. I learned this from my high school art classes. I had to wait for my art canvas to dry before I could begin painting, and wait for the paint to dry before painting another layer. I had to wait for my clay piece to dry before it could be placed into the kiln, and then wait as it was being fired. Adding finishing touches and details to works of art also require patience. Patience is not just one of my strengths as an artist, but as an educator as well. Teaching too, takes patience. In school, I was taught to use various media and methods to create art. I was taught to create art with countless things such as crayons, oil pastels, paint, pencils, clay, paper mache, recycled items, newspaper, and the list goes on. My teachers taught me that art takes many shapes and forms, and that it can be anything I want art to be. One goal I have set for myself as an artist and art educator is to integrate the arts into my curriculum as much as possible. A second goal is to provide a wide variety of art media and supplies to my students, to ensure that they gain as much as possible from their art experiences in school. My third goal is to work at an arts-integrated school, which will provide much needed support for me as an art educator, and help me better achieve my goals. The school I worked at back home on Maui is an arts-integrated school and has dance rooms and a garden, which is taken care of by the students. The minute I set foot on the school’s campus, it became my dream to someday have the opportunity to work there as a teacher. To achieve the goals I have set for myself as an artist and an art educator, I must graduate with my degree so that I can start teaching. With the help and support of my fellow teachers, hopefully I am able to acquire the materials needed to integrate the arts into my curriculum, as well as provide a wide variety of art media to my students. With a wide variety of art media and supplies, my students would have more options to choose from, and have the opportunity to be more creative with their works of art. 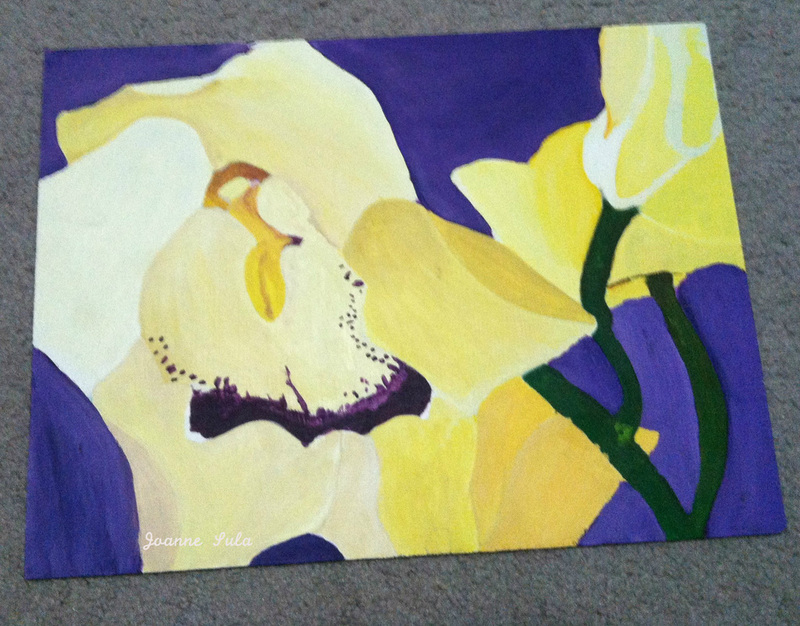 Artifact #1 - "Birthday Orchid"
This is a painting of an orchid that I made in my drawing and painting class during my junior year of high school. The canvas is a flat hardboard wood panel that was primed with gesso. This painting is titled “Birthday Orchid” because it was inspired by an orchid that was given to me on my eighteenth birthday by one of my friends. I chose this item because completing this painting required a lot of patience. Upon receiving the assignment, I was excited to start painting right away. However, I was instructed to prime the panel with gesso. I had to wait for the gesso to dry, and sketch out the orchid before I could even begin painting. This work of art taught me to be more patient, and also made me realize that creating artwork takes a lot of patience. This painting shows that even though I’m not that good of an artist, I can still be proud of my artwork because I know that I put my best effort into the creation of this work of art. This vase is slab vase that I made in my ceramics class during my junior year of high school. To create this vase, I rolled out slabs of clay and cut them into smaller square slabs. 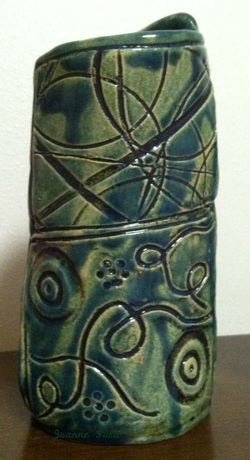 I put different designs on each slab and then joined them together using slip and thin coils of clay. To create the designs I used only clay tools and just one stamp. I chose this item because this is one piece that I am very proud of. When this piece was completely finished, my teacher came up to me and asked if she could hold onto it and enter it into the county fair’s school art exhibit, which took place the following school year. My vase was awarded with a fourth place ribbon in the 3-D art category in Division V (grades 11-12). This work of art taught me that hard work does pay off. I really tried hard to be creative with the designs and make sure that the slabs were joined securely. In the end, I was rewarded for my hard work. This vase shows that in art, a little can go a long way. My teacher provided a large variety of stamps to help design the slabs, but I just used the clay tools to create designs. Though I feel it is important to have many options, a little can go a long way too. I feel that it is a perfect way to describe our journey through the College of Education. All of our hard work now will eventually pay off once we graduate and earn our degrees. This is a picture of my grandpa and me when I was little. This picture was taken at his house on a day that my mom and I went to visit him. I was about three or four years old when this picture was taken. I chose this item because my papa is one of my inspirations. I try my best in everything to make him proud because I know that he is watching over our family. He was a soft-spoken man who loved his family more than anything. He always wanted what was best for his children and grandchildren, and guided everyone as best as he could. I look up to him and I always have this picture with me. This picture shows that in art and in everything else in life, it is good to have an inspiration, or something or someone to look up to. Beautiful artwork is almost always inspired by something. Good books and movies are inspired by or based on true stories. Inspirations help keep people motivated and determined. Whether it be by a person, place, thing, or dream, it is always good to be inspired; my papa is that for me.